Looking back at the trend of mortgages in 2018, we would have noticed that people are all big about fixed rates and many of you would have to ask why? The reason is simple, fixed rates were at a 1.55%, 2-years fixed whereas floating rates were at 1.6%, and looking at this minimal difference between the 2, it’s obvious why people would rather opt for a fixed rate mortgage. The US Fed had forecasted 4 increases for the US Fed rate and people widely believe that the SIBOR rates have a very high correlation with the Fed rate and thus speculated the instability with regards to SIBOR. True to their forecast, the Fed rate hiked up 25-50 basis points at every end of Quarter last year. Hence, clients were fearful that SIBOR-linked packages would only follow suit. Since many homeowners may not have the relevant financial knowledge to predict or forecast the expected behaviours and trends for interest rates, fixed rates were therefore, safer and more popular. The fixed deposit link (FD) rate pioneered by DBS in 2016 was widely popular among homeowners as well and many other banks such as Maybank and HSBC came up with their own versions soon after. The FD rates’ popularity were attributed to very low rates in the initial phase and there was common belief that these rates will remain subdued. Looking at the historical track record, most banks have not changed their FD rates from 2012 – 2017, and even up till the first of January 2018, the rates have remained the same. However, along with the US Fed rate increases, the banks saw an increase in the general trend and thus increased their FD rates as well later in the year. Taking a glance at this table, we would have realized that SIBOR packages had barely changed as compared to the other rates and packages available. With the difference between the fixed and the floating rates at more than 0.5% now, more and more people are willing to take some calculated risks to review a floating rate mortgage. The Fed holds the line on rate this year, with an initial forecast of 3 increases in 2019, but all of these are no longer on the table based on latest update as at March. Signups for SIBOR packages had at the same time steadily increased and are still increasing. On the other hand, Fixed rate packages were refreshed at much higher rates now than compared to a year ago, and other floating rate packages like FD-linked rates and Board rates are still relentlessly increasing, much to the unhappiness of many existing mortgage clients. The lowest FD Rate is from Standard Chartered in 2019 at 2.2% linked to their 36 months FD rates. The SIBOR rates in 2019 as compared to the FD rates are still cheaper by about 0.2-0.3%, though the difference is not as huge when compared to the 0.5% difference between the fixed and floating rates. Nonetheless, it is still a difference worth noticing because of the movements and the general increase in the trend that the FD rates had in the entire 2018 to the start of 2019. The original sense of stability that people once had for FD rates no longer exist. Therefore, current preferences are more for transparency over presumed stability. More customers are now favouring a market determined SIBOR over frequent changes in FD-linked rates as ultimately, Board rates are still the banks’ discretion. 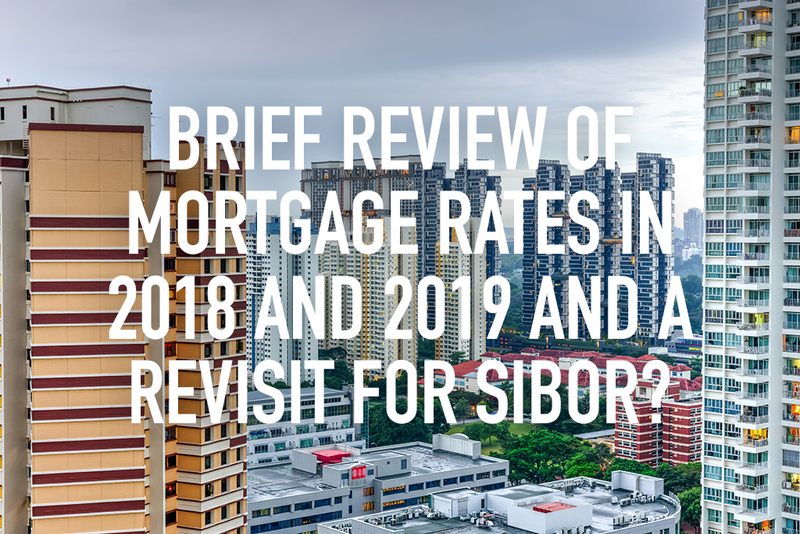 Though SIBOR packages provide cheaper and more transparent options, stability may still be a real concern for many loan clients. So what if our beliefs, assumptions and expectations were inaccurate? What if the Feds resume interest rate hikes again in the 2nd half of 2019, or early 2020? Clients will be glad to know that the SIBOR packages offered by some banks do come with “risk-hedging” features to help mitigating some of the above-mentioned rate risks. Firstly, there is a free one-time conversion. A package conversion is not usually available until lock-in period ends and it will also cost clients admin/reprice fees of $500 – $1000. To hedge against unexpected fluctuations for the SIBOR rates, one-time free conversions are being offered by some banks after lock-in, while other like SCB and HSBC are offering one-time conversions anytime. Therefore, if SIBOR does increase or even if SIBOR does not increase but there is a better package within the same bank, clients can exercise the feature and flexibility to switch. Partial Capital Repayment without Penalty; the next feature is catered to clients who are ever looking to pay down on their loans. Some SIBOR packages will allow clients to partial repay on their loan capital amount anytime during lock-in period without penalty. Otherwise, the repayment penalty chargeable during lock in period is usually 1.5% of the amount repaid, or $1,500 for every $100,000 of loan repayment. This penalty waiver will help some clients who can afford to make capital repayments to better manage their interest rate risks and costs while benefiting from a SIBOR-linked floating rate package. Last but not least, only 3 banks are offering this pretty interesting feature which is extremely suitable for clients with cash sitting by the side in the short term. Business owners or savvy investors looking to deploy monies into opportunities in the short to medium term can in the interim place their funds in an interest offset account. The interest offset feature from these accounts will help clients bring down their effective loan interest rate, subjected to the following 2 factors; The amount of deposits in the interest offset account and the Offset Factor. For example, 50% of deposits in the offset account will earn the same interest rate as the home loan rate. This feature is also totally flexible. Clients can deposit or withdraw the monies in these accounts anytime without lock in period, penalties or fees. This is also a good in-between option for clients who are half-minded about liquidity and loan capital repayment. The changes in the facts and figures of different mortgage rates and packages between 2018 and 2019 so far, plus the changes in opinions of clients for their view, expectations, and preferences, is a good reminder to all, including us as professional advisors, that there is never ever a 1 size fits all solution when it comes to helping our clients manage their property loan borrowing costs over their entire property ownership journey. Instead, helping them promptly review their loan portfolios and be updated on changing interest rate trends and to adjust their financing arrangements accordingly and on a consistent basis will ensure much better success from a cost management perspective. With the recent increase in interest rates, our team at Redbrick has seen a spike in the enquiries that come through to us. As such, we’re looking to expand our team! Know of someone who might be a suitable fit to be part of the Redbrick Team? Click here to find out more.